Uma torre da oto melara, com a 30mm que poderia equipar alguns Pandur, ou até alguns futuros Centauros como actualmente equipa no Exército Italiano e no Polaco. O Exército Português já tem uma versão do Pandur com canhão de 30mm. pois tem, tem 30 viaturas porta canhão 30mm, mas as torres só vem equipadas com a 30mm ATK Mk 44, nenhuma tem os 02 TOW. The main armament is an automatic cannon of 25 or 30mm, electrically controlled for elevation, traversing and firing operations; feeding is through belted roundshoused in two ammunition containers. A 7.62mm machine gun is coaxiallymounted to the main cannon. 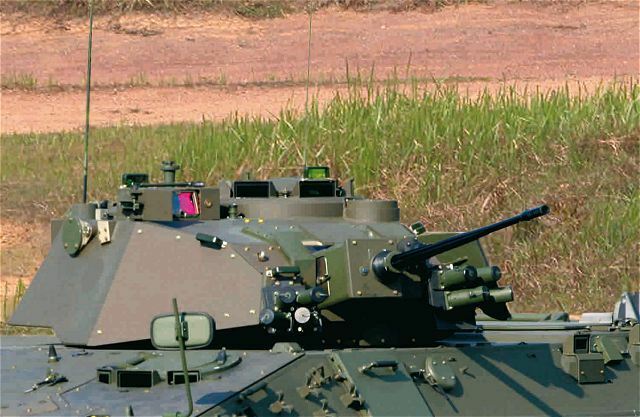 Two TOW armoured launchers are side-mounted on the turret with remote control (Digital Missile Guidance Set) integrated in the HITFIST fire control system. Four smoke-grenades discharger 80 mm are mounted to each side, on the front of the turret. 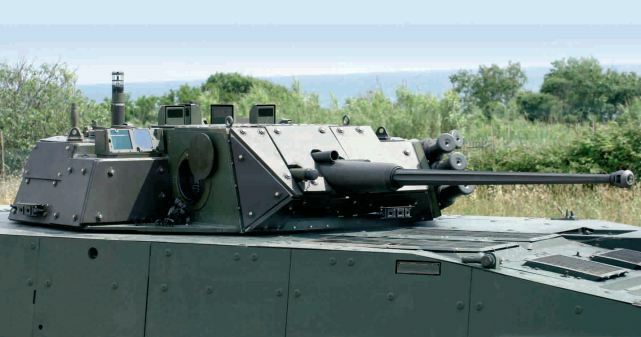 In the Italian Army, the HITFIST® turret is mounted on the armoured infantry fighting vehicle Dardo. The Polish HITFIST® turret is armed with a single 30mm ATK Mk 44 chain gun and a coaxially mounted 7.62x51mm machine gun. The turrets have provisions for the installation of two anti-tank guided-missile launchers. The fire-control system includes a Kollsman (Merrimack, NH) DNRS-288 day/night sight and incorporates a Galileo Avionica (Campi Bisenzio, Italy) TILDE FC second-generation thermal imager. The self-protection suite includes a PCO-Cenzin (Warsaw, Poland) SSP-1 OBRA-3 automated laser-warning system and six 81mm grenade launchers. The Italian Dardo HITFIST® turret is armed with an 25mm Oerlikon KBA automatic stabilised cannon which has a rate of fire of 600 rounds a minute. 200 rounds of ammunition are carried in the turret ready to fire. Two 7.62mm machine guns are installed on the turret, one co-axial with the main gun. Two TOW anti-tank guided weapon launchers are installed, one on each side of the turret. Aqui está um Pandur envolvido em ataque na RCA com o canhão. Isso é uma 12.7 montada num RWS. Salvo erro, não enviámos nenhum carro com a torre de 30 para a RCA. Afirmativo é um com 12.7 RWS! On April 12, 2019, the Indonesian Ministry of Defense issued PT Pindad a contract worth $ 80 million for the production of the first 22 Pandur II series 8x8 infantry fighting vehicles that received the Indonesian designation Cobra. The vehicles must be delivered to the Indonesian army within three years and will reportedly be equipped with the Israeli remote-controlled uninhabited combat module Elbit Systems U30MK.II, which Ares (Elbit Systems Brazilian) will supply with a Northrop Grumman Bushmaster Mk.44 30mm automatic gun and two 7.62mm machine guns. Four Pandur II vehicles were received by PT Pindad in 2017 from the Czechoslovak company Excalibur Army, which is part of the Excalibur Group (now called Czechoslovak Group - GSG). Excalibur, in 2015, acquired the license to manufacture the Pandur II armored vehicles from GDELS. Initially, the Pandur II family in the 6x6 and 8x8 configurations was developed by the Austrian company Steyr-Daimler-Puch Spezialfahrzeug, now part of the European division of General Dynamics Corporation as General Dynamics European Land Systems - Steyr (GDELS-Steyr). It was a further development of the previously produced – and very popular - Steyr-Daimler-Puch 6x6 armored personnel carrier. In 2005-2006, the Pandur II family was ordered as a new generation of armored vehicles by the armed forces of Portugal and the Czech Republic, but the implementation of both contracts faced considerable difficulties and delays, and was accompanied by significant technical complaints from both armies. As a result, both contracts were reduced and even partially canceled. In 2015, General Dynamics actually turned off the marketing of Pandur II and sold the full rights on its vehicle to the Czech company Excalibur Army, which organized the assembly of the Pandur II IFVs at a specially created enterprise controlled by the CSG company: Tatra Defense Vehicle, in Kopřivnice. In fact, as can be seen, the machines to be assembled in the Czech Republic are obtained in the form of kits from the Steyr-Daimler-Puch enterprise in Vienna, and are only completed in Kopřívnice. PT Pindad, in partnership with the Czechoslovak Group, is promoting the Pandur II 8x8 of the Indonesian army in several versions. In 2017, PT Pindad received four units of the Pandur II from the Czech Republic, and fitted them with an armament: two Pandur IIs were equipped with remote-controlled Ares REMAX (Elbit Systems) combat modules armed with 12.7-mm machine guns, one vehicle was equipped with an Elbit Systems uninhabited combat module / Ares UT30MK.II with a Bushmaster Mk 44 30mm cannon (this vehicle was demonstrated at IndoDefense 2018, in November 2018) and one non-floating vehicle was armed with a Belgian CMI Defense CMI-3105HP turret (Cockerill Series 3000) with a 105mm cannon ( a similar turret is mounted on a Turkish-designed FNSS Kaplan/Harimau medium tank). Apparently, the Brazilian branch as a mediator of Elbit Systems was needed by the Indonesian side in order to avoid delicate questions about the direct cooperation of the "Muslim" country with the Israelis. Previously, PT Pindad stated that the Indonesian army plans to purchase 250 units of the Pandur II (Cobra). O pandur II da foto tem capacidade de flutuação. JLTV com o PROTECTOR RWS LW-30 (M230 LF de 30mm e misseis anti-carro Javelin). Peças 10,5 a rapidez da entrada em bataria e o primeiro tiro directo, da 2ª secção BF num minuto e trinta ! !